South Australia  is a state of Australia in the south of the country between Western Australia to the west and Queensland, New South Wales and Victoria to the east, and south of the Northern Territory. It was first split off from New South Wales and proclaimed a colony in 1834, and unlike the other states in Australia was never a penal colony, instead being settled entirely by free settlers from Britain from the 1830s onwards. Following the British settlement, waves of settlers also began to come in from other parts of Europe, most notably Ireland, Germany, Italy, Greece and Poland. With nearly 1.6 million people, however, the state comprises less than 10% of the Australian population and ranks fifth in population among the states and territories. However, the state covers a vast amount of land area, including some of the most arid parts of the country. With a total land area of 983,482 square kilometres (379,725 sq mi), it is the fourth largest of Australia's six states and two territories. 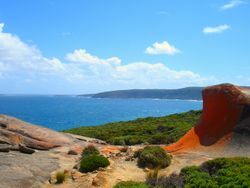 The state also includes Kangaroo Island, Australia's third largest island which lies off the coast of the mainland in the south-east of the state. South Australia is a state that has remained politically innovative and culturally vibrant throughout its history. It is known for its festivals including the Adelaide Festival, The Adelaide Fringe, WomAdelaide, the Cabaret Festival and its fine wine and produce. South Australia offers a different perspective on Australia - it is a place where you can get up close and personal with the authentic Australia, be that wildlife, the beauty of the outback or the long coastline. With world-class wine and other produce, friendly people, an unspoilt environment and a very relaxed pace of life, it offers the break in Australia that you may have been looking for. South Australia covers a vast amount of area, from coastal towns to arid desert. The more settled areas are in the south east of the state, hence the smaller regions around that area. Adelaide, the state's capital and its surrounds have plenty to offer for tourists and travellers. The Adelaide Hills surround Adelaide on the eastern side and have small villages with lots of history and lots of natural wonders. They're easily accessible from the city centre. 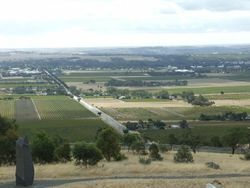 The home of some of Australia's best wines, the Barossa Valley, the McLaren Vale and the lesser-known Clare Valleys are the reason why many travel to South Australia. Besides wines, there's lots of history to see here too. South of Adelaide, the gateway to Kangaroo Island and home to coastal villages where you can escape to. The area surrounding the winding Murray River; South Australia's fruit-growing areas. Off the coast of mainland Australia, Australia's third-biggest island contains a vast amount of natural beauty unique to this part of Australia. Where South Australians go for their holidays. Enjoy beaches, national parks, and more. Where 2,000 kilometres of coastline and spectacular scenery meets treeless plains and desert. Home to the cities of Port Lincoln and Whyalla. The Flinders Ranges are home to Wilpena Pound, a spectacular natural amphiteatre and a great base for walking and exploring. The Southern Flinders Ranges extend down toward the east of the city of Port Augusta and include the 6,000 hectare Mount Remarkable National Park. In the north the Simpson Desert also presents its own adventures and opportunities. South Australia is 9 hours & 30 minutes ahead of Greenwich Mean Time and 17 hours & 30 minutes ahead of Pacific Standard Time (PST). Daylight Saving is observed from the first Sunday of October to the first Sunday of April the following year. You cannot bring fruit and vegetables into South Australia. There are disposal bins on roads and at airports, and checks are made - including dogs at airports and on trains and inspection stations on the roads. You will notice the signs and announcements. On-the-spot fines of around $400 are payable if you are caught with fruit or vegetables. South Australia's main air gateway is Adelaide Airport, (IATA: ADL) , which has most domestic and all international flights direct into the state. International flights direct into Adelaide include those from Guangzhou in China, Doha in Qatar, Dubai in the UAE, Hong Kong, Denpasar in Indonesia, Singapore, Kuala Lumpur in Malaysia and Auckland in New Zealand. In June 2017 direct flights to Fiji will be added. There are regular domestic flights into Adelaide from all Australian capital cities and some interstate regional centres such as the Sunshine Coast in Queensland, Geelong (Avalon) and Mildura in Victoria, Broken Hill, Alice Springs and Darwin in the Northern Territory. Mount Gambier Airport, (IATA: MGB) in the far south-east of the state has services from Melbourne in Victoria, flown by Regional Express (REX).. Other major regional airports include Port Lincoln, Kingscote (KI) and Whyalla. From Adelaide, Brisbane can be accessed by the Indian Pacific to Sydney and changing for the CountryLink XPT service to Brisbane. V/Line have a daily coach service from Adelaide connecting to the Countrylink XPT Service in Albury to Sydney. Note that South Australia has a very large land area with most settlements in the south-east of the state. Driving to the Northern Territory and Western Australia are very long drives. From Adelaide to Perth is 2,700 km and will take at least 2 days, probably 3. It is the sort of trip that even most locals only do once or twice in their lifetime. Driving from Adelaide to Darwin is just over 3,000 km and travels through some very remote parts of Australia. A minimum of 4 days is recommended. Sydney to Adelaide takes about 18 hours to drive (allow 2-3 days), and Adelaide to Melbourne is around 10-11 hours depending on the route taken. Allow 2 days to admire the towns on the way. The rural South Australian speed limit is 110km/hr. Every town you pass through will have a local speed limit (usually 60km/hr or 80km/hr) and police frequently target drivers at these locations. When crossing state borders also take care to observe the speed limit changes if any. Adelaide's Overseas Passenger Terminal is at Outer Harbor on the LeFevre Peninsula in the north of Adelaide. Visiting cruise ships often dock here. The State has a well developed highway system, however in the northern and western regions many roads are un-paved gravel or dirt roads and extra care must be taken. The article on driving in australia has some useful information and guidance. Road traffic laws and regulations  are vigourously policed in South Australia and visitors from other states, territories and foreign countries should familiarise themselves with the local conditions and requirements prior to planning a trip by road in South Australia. Statewide regional and intrastate routes are provided by several bus companies and they serve the Adelaide Hills, Mid and Far North, Mid North, Barossa, Murray Bridge, Eyre Peninsula and Far West, Riverland, Fleurieu Peninsula, South East, Kangaroo Island and Yorke Peninsula. Premier Stateliner,  Operates to Adelaide Central Bus Station, Ceduna on the west coast, Port Augusta, Port Pirie, Whyalla, in the Iron Triangle, Port Lincoln, Eyre Peninsula, Murray Bridge, Berri, Renmark, and Loxton in the Riverland, Keith, Bordertown, Kingston, Robe, Millicent, Naracoorte and Mount Gambier in the South East, Victor Harbor and Goolwa on the Fleurieu Peninsula. Mid North Passenger Services, (operated by Yorke Peninsular Coaches), . Operates to Adelaide Central Bus Station and destinations in the Mid North of the state including Clare, Burra, Peterborough, Orroroo, Blyth, and Gladestone. Yorke Peninsula Coach Services, . Operates to Adelaide Central Bus Station, throughout Yorke Peninsula, Copper Coast, Balaklava, Mid North, Southern YP-Intertown, Upper North YP-Intertown, Port Pirie, Port Augusta and Peterborough. VLine, neighbouring Victoria's bus and rail system also connects some South Australian centres, including Adelaide Central Bus Station, Adelaide Hills Bordertown, Broken Hill (NSW), Geranium, Murray Bridge, Mount Barker, Mount Gambier, Pinnaroo and Tailem Bend. The state is served by a limited commercial rail passenger network with services only provided to limited stops within South Australia that fall on the national mainline routes. Interstate services from Adelaide such as the Overland to Melbourne , The Ghan  to Alice Springs and Darwin and the Indian Pacific that links Perth, Adelaide, Broken Hill and Sydney and the Southern Spirit that links to Brisbane do stop to set down and pick up passengers at some regional centres on route. Great Southern Rail  operate all these services, ☎ 13 21 47 in Australia, ☎+61 8 8213 4592 if calling from outside Australia. Adelaide Metro, operate the remnant suburban and local train and tram services in and around the capital city and details are available in the Adelaide article. Several historic rail journeys are available. The SteamRanger preservation group in the Adelaide Hills has restored a number of steam and diesel locomotives for tourist services, and the Pichi Richi Railway based in Quorn operates on part of the former Central Australia Railway. The Cockle Train, operates year-round between Goolwa and Victor Harbor along the route of Australia's first railway. It operates with a steam locomotive in school holidays, and historic diesel locomotives or railcars on all other weekends. The Southern Encounter, runs from Mount Barker to Victor Harbor during winter, utilising most of the remaining broad gauge branch from the main Adelaide to Melbourne line. The Highlander, operates from Mount Barker to Strathalbyn using steam locomotives when possible. Operates on the second Sunday of each month from June until the end of November (excluding October). StrathLink, from Goolwa to Strathalbyn using a restored heritage "Brill" railcar. Operates during school holiday periods. Transcontinental, Quorn to Woolshed Flat. After a brief stop, on to Port Augusta, arriving in time for lunch. There is ample time for a stroll around the nearby area, including a range of food outlets, before the 2.30PM departure back to Quorn. Pichi Richi Explorer, Quorn to Woolshed Flat (32 km) and return. Uses a historic Barwell Bull railcar 106, built in 1928 that spent most of its working life based at Peterborough working services between Terowie and Quorn., as well as steam services during school holidays and long weekends using historic South Australian Railways carriages, some dating from the 19th century. Afghan Express, turns the clock back to the 1930s when the famous old Ghan travelled through the Pichi Richi Pass. Wherever possible, the Afghan Express uses distinctive timber-bodied carriages built in the late 1920s for the narrow gauge old Ghan train service, and restored old Ghan steam locomotive NM25. The Afghan Express is the name railwaymen gave to the passenger train that ran from Terowie to Oodnadatta, through Quorn, in 1923. Note: The National Railway Museum  is the largest undercover railway museum in Australia and is situated in Port Adelaide. The two main regional operators in South Australia are Rex Regional express  and QantasLink . The state also has a General Aviation sector including charter operators and wet lease operators such as National Jet Systems Cobham  and other smaller operators that service the airline industry, private individuals, tourism and the fly-in, fly-out services for the mining, oil and gas production industries active in the state. Parafield Airport, (IATA: none, ICAO: YPPF) is the states principal general aviation airport. General aviation services including charter operations are operated from both Adelaide Airport (IATA: ADL) in West Beach and Parafield Airport in the suburb of Parafield, 18 km north of the Adelaide Central business district (CBD) and adjacent to the Mawson Lakes campus of the University of South Australia. Parafield Airport is Adelaide's second airport and the fifth busiest airport in Australia by aircraft movements. Fleurieu Peninsula, Kangaroo Island, Yorke Peninsula and Eyre Peninsula have, or have planned ferry operations. Sealink,  to Kangaroo Island connects Cape Jervis on the Fleurieu Peninsula, and Penneshaw on Kangaroo Island. Ferries carry cars and passengers. Bus links are provided to Adelaide on the mainland and to Kingscote on Kangaroo Island. SeaSA, (Sea SA Car & Passenger Ferries), , planned to commence their ferry service between Wallaroo on Yorke Peninsula and Lucky Bay on Eyre Peninsula from mid-2011. Construction of the vessel the Aurora, has slowed due to difficulties experienced by the ship-builders, based in Indonesia. When the Aurora enters service it will carry cars and passengers. South Australia has a vibrant bicycle culture and the capital city of Adelaide has many established cycle paths and bicycle travel networks  and regional trails. Adelaide and regional cities have well stocked bicycle shops  and many clubs and associations. In Adelaide the City Council provide Free City Bikes  at several locations. South Australia has a number of taxi companies that serve both the main city of Adelaide, regional cities and regional areas. . Other options include Uber or EcoCaddy - an innovative tricycle service in the CBD. South Australia is home to Kangaroo Island , an internationally renowned wildlife haven. It is also known for its wine. The Barossa Valley is Australia’s richest and best-known wine region. Premium wines, five-star restaurants and cellar doors abound among the hills and vineyards. Local winemakers include household names such as Seppeltsfield, Penfolds and Jacobs Creek / St Hugo. South Australia also offers other world-class wine regions, including the Clare Valley , Adelaide Hills, McLaren Vale and Coonawarra. Visit the world-heritage listed Naracoorte Caves, or awesome Wilpena Pound in the Flinders Ranges – one of Australia's first official national landscapes. Swim with wild sea lions at Baird Bay on Eyre Peninsula , dolphins at Glenelg, and Great White Sharks at Port Lincoln. South Australia is also known for its exciting events, like the international cycling race Tour Down Under . Lance Armstrong made it his comeback race in 2009. Adelaide hosts the Clipsal 500 , a thrilling V8 race through a city circuit. The Adelaide Fringe  is an annual feast of comedy, music, theatre and fun. And the fabulous and captivating Adelaide Festival of Arts takes place every year in March. In Adelaide, South Australia's capital city, you will find stylish architecture, boutique shopping, sandy swimming beaches, fabulous arts events, nightlife, fine dining, and some of Australia's best café strips. It is easy to navigate your way around South Australia, with most of the regions just an hour or two drive from Adelaide. While tropical dives sites like the Great Barrier Reef or those in Southeast Asia are more popular, those who are more adventurous should consider diving in South Australia, which offers some very good temperate dive sites. Those of particular interst include Rapid Bay, which home to leafy sea dragons, a type of seahorse which is only found in the temperate waters of Australia. South Australia has a good reputation for high quality fresh food and produce. The Adelaide Central Market  is in the city centre just to the west of Victoria Square and has an enduring reputation for fresh market produce as well as cheeses, smallgoods, fresh seafood, fresh butchered as well as processed meats and a huge range of culinary speciality items bearing an Australian, European and Asian food heritage. The Central Market precinct is the location of Adelaide's small Chinatown and has many Asian food outlets and restaurants. Many cafes, restaurants and retail food outlets line the streets around the Market complex. The official opening of the Adelaide Central Market was on 22 January 1870. The Central Market was open on Tuesdays and Saturdays with 50 to 100 produce carts. The market sold vegetables, fruit, hay, fish and game meats. On 8 February 1900 the first stone was laid to build the current Central Market façade, which still stands today. In the same year a 40 meter veranda was added. The state produces citrus fruits such as oranges, lemons, grapefruit, stone fruits such a nectarines, peaches and plums, apples, pears, and table grapes such as sultana and muscatel. Wheat, barley and oats are staple grain crops, legumes such as peas and many bean varieties are also produced. The state has an extensive market garden industry growing a wide range of vegetables in all seasons. Nuts such as almonds and walnuts are grown near Adelaide and the state has a vibrant high quality olive oil industry. Seafood is both farmed in sea-water pens, grown in onshore tanks and caught in the wild by line fishing, trolling and trawling. South Australia has a well developed tuna, scale fish, oyster, crayfish (lobster) and abalone industry. The cold fresh waters of the Southern Ocean and the two gulfs have historically been bountiful but due to overfishing stringent controls have been brought to bear upon both commercial and recreational fishing. Historically, inland waterways such as the Murray river and the Coorong were also highly productive but have declined drastically due to environmental impacts and degradation. The state also has a highly developed viticulture and wine making tradition and the industry produces many wine varieties for local, national and international markets. South Australia also has a good reputation for rearing beef cattle for veal and beef meats, dairy production including milks, yoghurts, fresh and matured cheeses. The state has a strong history of sheep meat production including mutton and lamb. Local game meats include kangaroo and rabbits, which are wild harvested, normally in the mid-north and far north of the state. The poultry industry is well developed and provides both battery farm, free range and 'organic' eggs, chicken, ducks and turkeys. Adelaide especially has a good reputation for restaurant and cafe dining. Other areas, including the Clare Valley, Barossa Valley and Kangaroo Island have strong regional cafe and restaurant industries that exploit the high quality fresh produce available in those areas. The ethnic culinary influences and production skills borne by many generations of immigration has helped the development of the food and produce industry in South Australia. Italian, Greek, Polish, German, Malaysian, Chinese and Vietnamese immigrants to the state have had particularly strong influence on the development of the states food culture. Coopers Beer, is an icon of South Australia. It is often described as the biggest small brewery in Australia. It is still family-owned. All Coopers products claim to be made by "natural" methods. There is a range of products from crisp lager styles to dark stout. South Australian pubs will often have Coopers Pale Ale on tap, which while not as distinctive as a craft beer, certainly gives the beer aficionado a tasty beer option not widely available in other states. West End, is the local mass produced lager, on tap just about everywhere. Southwark Premium, is also produced by mass produced Lion Nathan, but at a smaller brewery in Thebarton. Arguably one of the best brews produced in Australia by the mega-brewers. Beer measures in South Australia are the schooner and the pint. A schooner is a smaller measure, known variously as a middy or a pot elsewhere in Australia. A pint isn't a pint at all, and is a larger size known as a schooner everywhere else in Australia. In most pubs in SA a pint of pale will return you a reasonable measure of Coopers Pale Ale. Queensland, Western Sydney, South Australia, and North Territory sees homosexuality as a sin and frowns upon it. Violence towards LGBT occurs and police may turn a blind eye to it. Also discrimination against LGBT is common and laws against it are never enforced. South Australia still has a gay panic defense intended to lower or eliminate punishment for anti-LGBT attacks. LGBT in Queensland, Northern Territory, and South Australia should keep their sexuality private. Racism is taken very seriously by police and security personnel and will be dealt with accordingly. 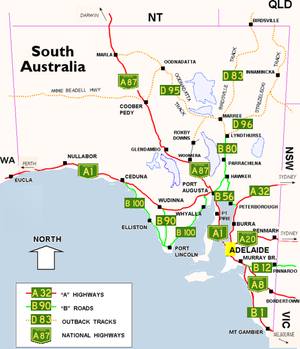 Highways that connect to other Australian destinations.